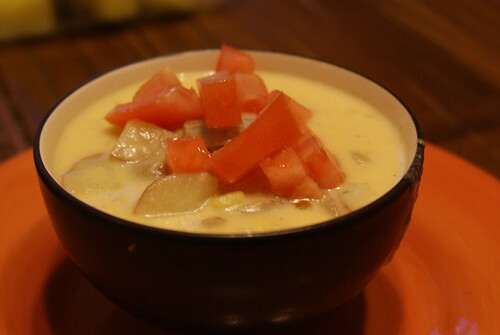 sausage and corn bisque, originally uploaded by laurasjoquist. Soup number six was a New Orleans smoked sausage and corn bisque from allrecipes.com and I again failed to follow directions. But it turned out delicious anyway. Here’s a link to the original recipe, which I am sure is also delicious. Soup number seven was left over soups. Because apparently when you make a big pot of soup every night for almost a week, you end up with a lot of leftovers. hot and sour soup, originally uploaded by laurasjoquist. 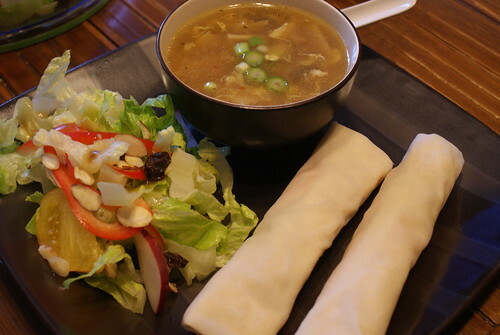 Tonight’s soup was Hot and Sour served with tossed salad with Asian dressing and spring rolls. Dessert was apple pie. I realize that was out of region, but I really wanted some apple pie. I’ve been making this excellent soup so long, that I no longer have an actual recipe and just kind of throw it together from memory. I do remember it came from a purple book my mom gave me back in the days when I was a vegetarian in between husbands. It goes best with a gooey grilled cheese sandwich. Chop up half an onion and a couple cloves of garlic and a red pepper. Saute in olive oil for a few minutes, until soft. Add a can of stewed tomatoes. I like to use the whole ones and crush them up as the soup cooks, but you could use diced. (I think the original recipe called for fresh tomatoes, but I’m pretty lazy.) Bring to a boil and cook for 5ish minutes. Then add 5 cups of broth or, if you’re lazy and cheap like me, 5 cups water and 2 bouillon cubes. Bring to boil and simmer for 20 minutes. Add a cup of fresh or frozen corn and as much fresh leaf spinach as you have sitting around the kitchen. Of course if it’s winter and your spinach is frozen, you can add it that way too. Bring back to boil and make sure spinach is nice and wilted before serving. I think the proof of deliciousness is in the picture of the child happily eating it. 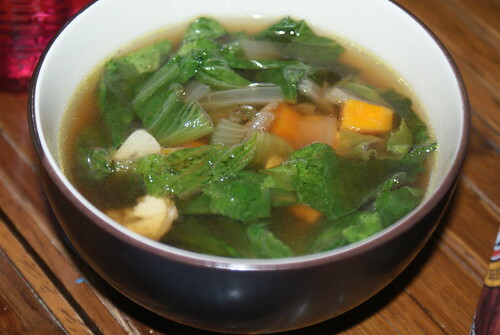 tofu lettuce soup, originally uploaded by laurasjoquist. Jack and I have decided to do 30 days (more or less) of soup. The first soup was Tofu Lettuce. I love this soup and it is so very easy it almost seems like cheating.